At the end of 2017 I ran a Christmas Stitch Along (SAL) and I loved it, so I knew I had to do another one and decided to go the opposite way and do a summer one this time. The SAL will be happening in my Facebook group and I’ll be keeping the pattern a secret until we start stitching. If you do want a peek at it though just get in touch and I can show you. You will need to join the group if you want to take part, but you can always leave again if once it’s finished (but obviously I hope you stick around for stitchy chat). On the 13th May I will have some sets available to buy with the basic supplies you will need for the SAL. The design is quite big and full of lots of colours, but please see below about the twist as you may need to buy some extra threads. And of course, you don’t have to buy supplies from me at all. I will be posting all the colours you will need before hand as well as Aida size and count so you can use your own stash or buy from local craft stores. The stitch along will start on Sunday 10th June 2018 and will run for 9 weeks, finishing on the 12th August 2018. Each week I will be breaking the pattern down into sections for us so we can try and stay in sync and finish together. Of course, life happens and some of us may fall behind (including myself possibly) but this is obviously OK! The point is to relax and enjoy stitching together, not stress over what section you’re up to. I will always try to be a week or 2 ahead to make sure the pattern looks good before you stitch too. And, my little twist this year is that you will have 2 options to choose from each week so you can build the pattern to suit your personal preferances. There will be a British Summer Time theme and a Tropical Fiesta theme, but you can mix and match them up too (this is what I’m planning on doing). However! This also means that the supply kits may not have all the colours you need as the kits will be for the 2 themes. If you choose to mix them up you may need extra threads, but don’t worry! I plan on having a stock of extras if you need to buy any more and there are some cross overs of colours too. During the 9 weeks I will be sharing your photos (with your permission, obviously) across my social media and we will have our own hashtag #HHMstitchalong for when we are sharing on our own profiles. Just to add, if you would rather join in with one of our other Summer cross stitch kits, you can shop the collection and stitch along with one of those instead. I am so, so excited for this and I hope you are too! If you have any questions please just get in touch. 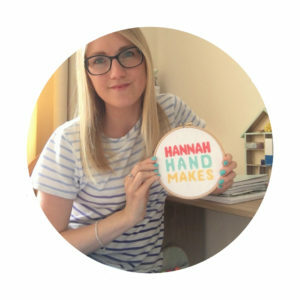 You can email me at hannahhandmakes@gmail.com or message me across any of my social media channels.